Do you live in an urban area where little grass is available? There is nothing like lying on grass that is freshly cut and well maintained. 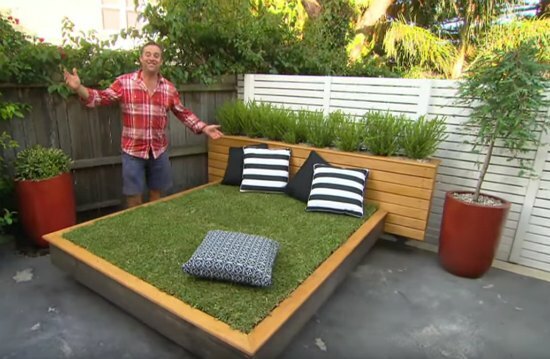 If you want a great way to enjoy fresh grass at home, then perhaps the best option is to create a grass day bed. This is perfect for an open concrete area. Measure the area for your day bed with the tape measure. Your day bed will need to fit inside this area once it is constructed. Measure the 2×6 boards and cut them to the required length with the saw. Secure four boards to make the frame and then secure boards to make a platform. A bed is not complete without a headboard. Simply attach 2×6 boards together to create a planter box that will double as the headboard. Measure and cut a few more 2×6 boards for the top frame and then attach them with screws. This is needed to hold the dirt for the bed. Take a sander to the boards to smooth them out before adding a coat of paint with the rollers. Add trim to give your bed a custom look. Lay out the garden fabric inside the bed and then start filing with dirt or gardening soil. Make sure you tamp down the dirt to get rid of all the air or the grass will not grow. Now is the time to add a fertilizer to the soil. You are now ready to lay some sod to complete your grass day bed. Don’t forget about adding plants to the planter box headboard.